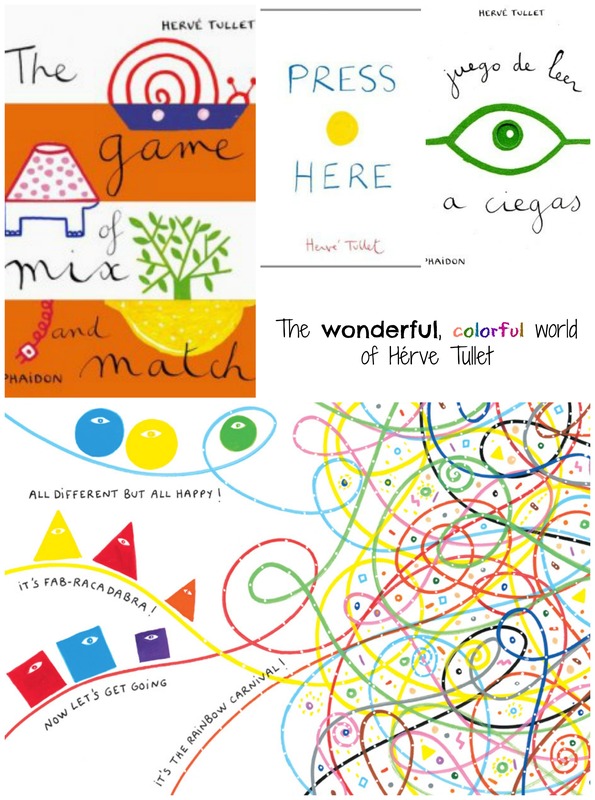 Have you ever seen or heard of Hervé Tullet’s picture books? They are a marvelous romp of color and whimsy, I had the pleasure of receiving Press Here as a gift for my daughter a few years back. Up to this day, and now my toddler son too, it is one of the most read books in our house. In the book the children get to press different colored circles and “make things” happen: make the circles change colors, change places, change size. It’s wonderful in its simplicity and ingenuity, and helps kids play with their sense of wonder and imagination. A few years later I also got The Game of Mix and Match which is a Board Book to make different figures by flipping the boards, as they all have half a drawing of something to match a half drawing of something else. My son, now 18 months old, can spend a long time flipping back and forth through all the different possibilities. Herve Tullet’s books are great aren’t they. We love Mix it Up too. Thanks for stopping by! I do have to check out Mix it Up… any other books by him you love? Great review, thanks! I know our Art Teacher uses Mix It Up with the students, and they really enjoy it. Thanks for sharing with #KidLitBlogHop! Thanks for stopping by! Do get Press here if you don’t know it. It is a lot of fun for younger kids! More books to add to our reading list! These will be so much fun for my daughter! Awesome! Both my kids love his books! Thanks for stopping by! Hervé Tullet is such a genius – he totally gets kids! He has such a unique and recognizable style. Thanks for sharing in the Kid Lit Blog Hop! Genius is definitely the word! He entirely understands the world of kid imagination. Glad you liked the review!